The city attracted more than 5 million visitors as a result of public art, some estimate. 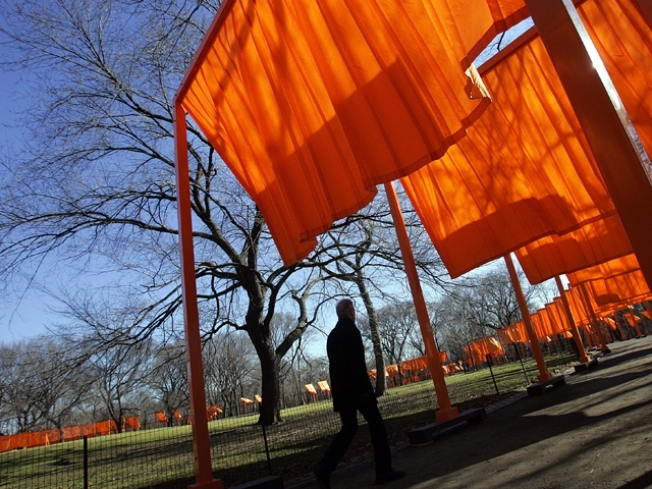 A man walks through the gates with saffron colored material at Christo's 'Gates' art installation in 2005. The Gates were displayed along 23 miles of paved paths throughout Central Park . It will be the largest public art display in New York City history. In the last three years, New York City has hosted two grand public art installations: the saffron fabric Gates exhibit in Central Park in 2005 and the recent Waterfalls show near the Manhattan and Brooklyn shorelines. In both cases, officials say the projects generated staggering amounts of money for the city. The Gates, they say, brought in a whopping $254 million and 4 million visitors, and The Waterfalls generated $69 million and about 1.4 million visitors. Some experts question those numbers, saying they seem a little extreme. But the city says they involve a complex methodology. It includes: survey responses; ridership data from tour boats and mass transit; visitor headcounts; hotel and restaurant bookings; retail and souvenir sales; and attendance rates at other cultural institutions.